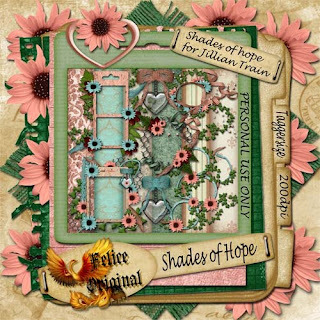 I'm so exited to anounce that i'm a proud member of the Shades Of HopeFor Jillian Blog train. All the designers made a beautiful freebee to share with you all. These designers come from all over the world and in all diferent time zones , so if there part is not yet on theire blog, have a little patience and return on a later time. Enjoy the gifts and leave a command when you download please. Happy Scrapping and Tagging girls. Thank you! Your blog post will be advertised on the DigiFree Digital Scrapbooking Freebie search engine today (look for timestamp: 21 Nov [LA 02:51pm, NY 05:51pm, UK 10:51pm] - 22 Nov [OZ 09:51am]). Thank you so much for this Freebie. 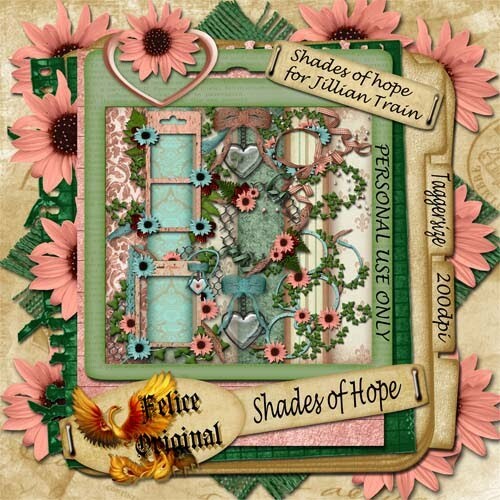 I want to let you know that I posted a link to your blog in CBH Digital Scrapbooking Freebies, under the Page 9 post on Nov. 22, 2009. Thanks again. This is gorgeous . Thank you so very much for sharing it . Stunning kit Felice. Many thanks for sharing in this blog train for Jillanne. The warmth and love I've felt through this blog train is amazing. Just popping in to let you know that I used some of your contribution to the "Lets Be Thankful" blog train in a LO on my blog!!!!!! !